THUNK! The arrowhead slammed deep into the tree next to where Zack Stand was hiding from bandits. He jerked his head, pulling out a few hairs that had gotten embedded with the steel bolt head. Arrows? These idiots don't have archers! I doubt they would know which end to shoot. He ducked down, sighting back along the arrow's trajectory, moving back and forth a few inches to see around one tree or another. There! I thought these bandits were stupid. This one's even wearing a red shirt. Zack remembered when he'd worn a similar shirt while infiltrating a bandit gang to identify him when the Zenith's Guard attacked. I don't think this is the same. He smiled at the thought as he silently crept to deeper cover and closer to Currat, his partner in the service of the Zenith Lord. Zack sounded a perfect imitation of a wren. Currat answered the signal and met Zack in his new position, eyebrow raised. "An archer in a red shirt! Almost put an arrow in my head—close enough to pull out hair. He's in a tree, and I don't think he knows I found him. We should take him out before dealing with the bandits. There's only twelve of them, and I think they're as thoughtless as we figured. The way they lounge about, they'll still be here." Currat nodded. The two spies circled around to approach the archer from behind, their multicolored cloaks hiding them well in the forest trees and brush. Currat took point, as stealthy as a cat. It took longer than expected, the brush and brambles becoming thicker and trees growing closer together. Finally, Zack pointed into the branches overhead. Currat nodded, and took a position that gave him a reachable knife throw. The archer had built a sling holding a platform braced against the tree he rested against. Currat watched Zack move into a place with equal throwing distance ten yards to his right. The archer jerked about, raising his bow, arrow nocked and starting to pull back the string. Zack stopped in mid-throw, nearly losing his dagger. The lad steadying his bow into a shooting position overhead couldn't have been more than twelve or thirteen summers. Zack flashed a hand signal to Currat, then stepped forward, pulled the cowl of his cloak back, and put a finger to his lips. The boy looked confused. Waving at him to come down, Zack stood clear, an easy shot. The boy started to aim. A throwing dagger thunked into the tree trunk, as close to the archer's head as the arrow had come near Zack. Startled, the youngster looked all around, but maintained enough presence of mind to not loose his arrow. Seeing nothing, he brought his attention back to his first target, who shrugged and put his hands out, palms up, motioning the boy down once more. A few heartbeats passed before another knife sank into the tree, just below the first one. Looking defeated, the boy started down. Zack held his hand up again, raising his finger to his lips and pointing for him to bring the knives with him. After a few more gestures, the knives landed on a mound of dead foliage. The boy came down to several feet from the ground, jerked the rope, and grabbed the harness before it could crash into the undergrowth. He started to jump off the tree, and Zack again shook his head, holding his arms out to him. He landed in Zack's arms in a cradling position. Zack had to chuckle; the lad was actually smiling. Currat snuck up behind them. "Thanks for getting my knives down. I don't like climbing trees," he whispered. The lad twisted around, his eyes widening at the second man. "I didn't hear you and couldn't find you." Currat smiled and pointed his chin toward Zack. "You wouldn't have seen or heard him if he didn't want you to, either." The boy looked back and forth between the spies' twin-like appearance in face and powerful body, twice. His shoulders relaxed in Zack's arms and he soon stood on his own. "I guess you both are pretty good hunters." Zack chuckled again and knelt in front of the youth. "Why are you out here?" "Those men—" He sniffed. "Those men…killed my family—my da, mom, and older brother. There were six of them. They did it from ambush. My da went down first with two slashes, and then my mom and brother …stabbed from the back. I was in a tree waiting for game. I cried out, but they couldn't find me. I waited until dark, and tracked them in the moonlight. They don't know how to move in the forest, and their trail's easy to see. I, or you, could have tracked them with no moon! I knew they would have to come back through the forest where you stood. It will be easy enough to pick them off." "What's you name, son?" Currat asked. The lad jerked toward him. "I'm not your son!" he hissed. "Easy lad, easy," Zack said. "He meant nothing by it. Now, tell us your name." The youngster turned back to Currat. "Sorry, I'm… sorry." The tears came in a rush; he took a deep breath and sobbed. Zack stood with the lad in his arms, resting his head on his shoulder and patting his back. It took several moments for the sobs and tears to stop and then he relaxed in the strong arms holding him. "Sorry—a man shouldn't cry," he squeaked out. "Whoever told you that?!" Zack said. "I cried when my wife and daughter were killed by bandits. Sometimes, it's good to let your feelings out before they fester into something you don't want eating at you." Currat took the youth by his shoulders, looked directly into his face. "We work for the Zenith Lord. I've killed many bandits and murderers, and I cried when my da was killed." Looking between the spies, the lad spoke in a stronger tone with wide eyes. "Really…you work for the Zenith Lord?" "My name is Obien Webster. Our…my farm's about a mile northeast of here." "You're very good with that bow," Zack said. "My da made me my first, and I can't remember far enough back to when I received it. He told me I was two summers grown." Pride crept in his voice. "I brought a lot of game down for food. I learned how to make the arrows hit so the animal wouldn't suffer. He told me that was important." "Your da was right," Currat said with an approving nod. "Now, you want to watch us capture or kill some murdering bandits?" "I…I want to kill them!" "I tell you what," Zack said. "You'll have our backs. I know how you must feel, but now isn't a good time for you to start killing men. If you wait, I'll see what I can do to put you under the Zenith Lord's care, but only if you promise to wait." Obien's eyes returned to full roundness. "You…you can do that?" Currat chuckled. "Yes, he can do that!" The lad thought for a moment before saying, "To leave, they have to come through here. I'll go back up the tree, and if one gets by you, I'll wound him. I'll try not to kill him, just make him hurt…a lot." "Fair enough," Zack said. "But no stomach, head, or back wounds. Promise?" Obien looked deflated, but he nodded. Before the spies returned to the trees overlooking the bandit's camp, the lad sat back in his harness, up the tree. "Swords or knives?" Currat whispered. "Let's take down a couple, and see if the rest will surrender. I don't like the way the boy said these bastards killed his parents. If they won't lay down, we'll kill them." Currat nodded. "I agree. They're murderers, and it'll save the boy from reliving his ordeal for the Zenith's justice." THEY caught their first bandit returning from a badly made latrine, judging by the smell. Zack's thrown blade caught him in the throat, cutting through the hyoid bone and windpipe. He toppled forward, pushing the knife through his spine. Other than slapping the ground, he didn't make a sound. "Hey, what's wrong with you?" a bandit called out as he walked to the body. "Seven Hells! He's dead!" As he whirled around and began running toward the rest of the men, a knife slammed into his chest on the left side, the snap of bone cracking in the air. A second knife pierced his throat from the right side. "Throw your weapons in the fire, walk six paces toward me, and lay down on the ground!" Zack called out. Confusion and fear ran through the four remaining bandits: "We can take them!" "Are you an idiot? You can't throw a knife like that!" "If they take us, we'll hang for killin' that family!" "They don't know about that—!" "Yes, we do!" Currat called from other side of the camp. "Find them; kill them! I'm not gonna hang!" The bandits drew long swords and charged at where Zack's voice had sounded. The last man among them gasped in pain as Currat's dagger sliced into his back. Staggering, he fell when Zack eased from the tree line and ran his blade through him. They turned down the trail, putting them out of Currat's line of vision. Zack's knife rammed into one's throat at the base of his neck. He went down. Currat reached Zack as the last bandit ran down the trail. "Why'd you let him get away?" Disbelief rang in Currat's voice. "I thought Obien should have some fun." As if on mark, a cry of joy came from down the trail, followed by wails of pain. When the spies found Obien, he swung a length of rope across the bandit's back. From the look of the coward's shirt, the boy had been at it a while. The bandit screamed anew as each lash landed, drawing fresh blood. Obien swung again, the rope catching on the ends of the two arrows coming from a thigh and calf. The bandit's answering shriek came full-bodied and long. "That's enough, lad!" Zack said. "We need something left to hang—"
"Lad?!" the murderer yelled. He flipped over and looked on his attacker for the first time, rage twisting his face. Reaching inside his front trousers, he drew a knife and cocked his arm to throw it. Zack's short sword chopped through bone and into the ground. The bandit's throwing arm collapsed in two pieces. The blade fell into the dead man's arm, point first, quivered once, and then tumbled to the ground. Currat looked at the pleasant scene around him—large mature evergreens, blue skies with white clouds, a hawk soaring high above him. The birds had returned after flying from the shouts and sounds of death; their songs seemed surreal to him. Flourishing greenery smelled of the freshness of new life. The contrast to the gore surrounding him made him sad, but the rescue of the lad softened his concern, and he smiled a little. Zack aligned the bodies in a neat row, except for the last one, and then took their purses and saddlepacks. He gathered their six still frightened horses by lashing the leads together with the picket rope in one long line, and recovered Spellbinder and Snowflake, Currat's and his mounts, respectively. Guiding Spellbinder with his knees, he held the lead for the thieves' horses in one hand and Snowflake's reins in the other, before placing them in Currat's hands. 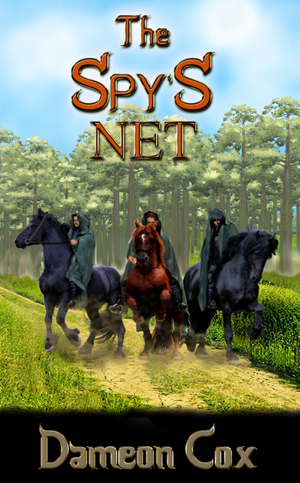 The saddlepacks rode on various horses and the purses rested in his cloak's pocket. Obien's eyes still held a shadow of disbelief when Zack reached Currat and him. Zack eyed him with concern. His voice, while strong, had a gentle touch. "Obien, do you have a horse?" "No, she died last week. That's why Da had all our coins in his pouch. He wanted to go into town and buy a mare for plowing and the wagon." "Well, you're a good hunter. Do you know horseflesh, too?" The lad shook his head. "That's all right. Currat knows a lot about them. Go with him and he'll show you some pointers. When he's done, you can pick out the best horse for you. You do know how to ride, I hope?" The smile on Obien's face answered the question before he said, "Yes!" By the time they returned, Zack had examined the contents of the thieves' saddlepacks and placed several pieces of parchment aside, throwing lots of dirty, stinking clothing away. Standing, he smiled, recognizing the horse Obien rode as the youngest and strongest the thieves had. He mounted Snowflake and they headed for the nearest garrison, some seven miles away. Reaching the large fort an hour before lastmeal, Zack and Currat talked with the garrison commander, going over the parchments they'd found, and explaining the need to place the coins in trust for Obien. The commander agreed, and sent ten men, a pebble in the Zenith Lord's Guard out to bury the bodies and to Obien's farm for a more personal ceremony. The commander also agreed to send the lad and Zack's report to the Spires with a detail leaving the next day. THE next morning, Currat and Zack waved to Obien as he struck out with the pebble of men going to the Spires and a new life. Turning to head back to their quarters, a man holding a piece of parchment ran toward them. "Master Zack," the priest said, slightly out of breath, "I've received a message from Master Gaz for you. It's the strangest one I've ever seen, just a bunch of numbers. I read the bird's mind three times to make sure I got them all and in the right sequence." The graystone—the device allowing him to interpret messages flown in by birds—that usually remained under a priest's shirt, dangled on a gold chain that hung nearly to his waist. Zack took the message from his superior, the Zenith Lord's spymaster for the Seven Realms, looked at a few of the numbers, nodded, and thanked the priest before Currat and he started off again for their quarters. Once back inside their chamber, Currat sat by the window and held out his hand. "May I?" Zack smiled. "Of course." He handed over the parch-ment and codebook from his saddlepack. "We are to return to the Spires in all haste." Currat said after a pause. "Do you know someone named Openhand?" Zack looked surprised, and nodded. He thought of the enormity of the Spires, the Zenith Lord's seat of power outside the city of Stonefire in the center of the realm with the same name. It was the closest feeling of home he could muster.